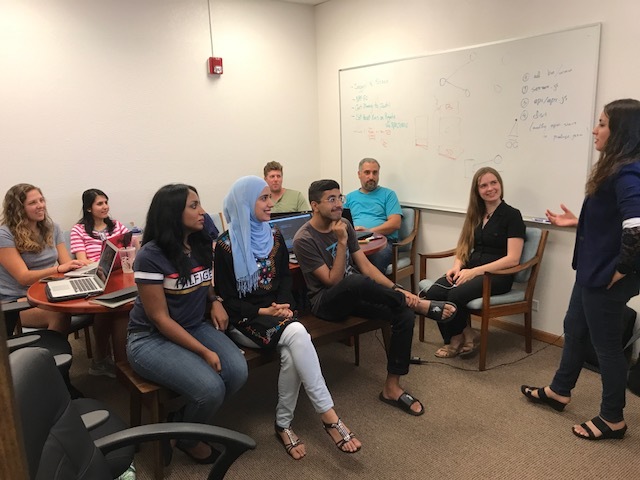 Two Global Talent Idaho participants—a GTI alumna and current job seeker—are among the inaugural Ambient Sensors 10-week intensive software development bootcamp created by Clearwater Analytics software developer Nilab Mousa. Nilab, a graduate of Boise State University in Computer Science, partnered with local startup Ambient Sensors to create the bootcamp after seeing a need for college graduates to refine skills learned in the classroom for the workplace. “Even for college graduates in the U.S. it’s a challenge to adapt your mindset to what employers are looking for,” Nilab says. She has opened the bootcamp to everyone from beginning coders to current BSU students and graduates, as well as internationally trained job seekers looking to learn more about the American workplace. The 13-person group was divided into teams to build apps, including one that streamlined information about the Idaho Legislature, one that created a searchable database of books with diverse representation of both authors and subject matter, and one that helped users analyze micro-climate data collected through the Internet of Things. GTI participants Hasan Al Rubaye and Raghad Al Fatal are both completing the internship. Raghad graduated with a BS in Iraq and will pursue an MS in Computer Engineering at Boise State University in the fall. She says the internship has made a huge difference in setting the foundation for her future career. “This internship will make me more appealing to potential employers and will put me one step ahead in this world’s competitive market,” says Raghad. Nilab will additionally be teaching a class at Boise State University in the fall about Technical Interviewing, another component emphasized in the bootcamp through dedicated interview preparation time and guest speakers from companies including Clearwater Analytics, Google, AppDetex, HP, Kount, Micron, and IBM.